So, here's a really easy recipe so that you can make some yummy little Thanksgiving treats for your friends or just a salty, caramelly, sweet snack for a party or yourself! 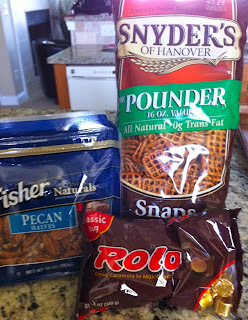 It's so fast and easy- it has only 3 ingredients: pretzels, Rolo candies, and pecan halves. The part that takes the longest in this recipe is unwrapping all of the Rolos! In the end, these taste like Turtle pretzel bites- how can you not like them? Start by preheating your oven to 250 degrees. Lay some pretzels on a baking sheet (I used square ones, but I'm sure you could use small twists.) Then, put one Rolo on top of each pretzel. 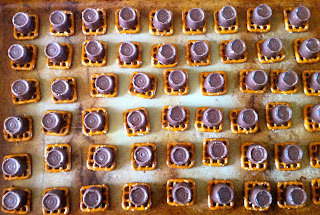 Bake it in the oven for 4-5 minutes to let the Rolo soften. Don't let it stay in too long! When you remove it from the oven the Rolo will still look the same. Place a pecan half on top of the Rolo and press down a little. Stick the pan in the freezer for about 5-10 minutes to let everything set. Try to eat only one or two of these- you can't! Indulge your salty-sweet cravings! Thank you to Glorious Treats for this gem from Pinterest.